Ken and Julie are a recently paired husband-and-wife team featuring singer/songwriter Ken DeAngelis and soprano Julie Ziavras. Ken & Julie present original acoustic music with thought provoking lyrics, rich harmonies, gentle and pure vocals, headlining in concerts and at folk venues with an arsenal of Ken’s original songs and a strong repertoire of contemporary and traditional folk ballads. "Together they make wonderfully detailed music that features evocative lyrics, lovely harmonies and melodies that stay with you long after you hear them" (Steve Isreal, The Times Herald Record). Singer/songwriter Ken DeAngelis, a native of the Hudson Valley NY, began studying music, accordion and writing songs at an early age, teaching himself guitar and harmonica. His original songs, which incorporate unique guitar flat and fingerpicking styles, often describe personal experiences. Reviewers have described them as "poignant and heartfelt, personal, yet universal in scope"; "effectively expressive of human emotions", "each with thought provoking lyrics or a story to it, making their music expressive and riveting" (Richard Ross, The River Reporter). They have been widely recognized in the Hudson Valley, and featured on radio, at numerous song festivals and have won awards at song competitions. Soprano Julie Ziavras has been featured as both a folk and classical singer in concert, radio and television in the U.S. and abroad. She holds both Bachelor and Master's degrees from the Manhattan School of Music and has coached with Metropolitan Opera conductors including George Schick and Alberta Masiello. A New York Times reviewer described her as "an estimable vocalist with a silvery voice…cradling her guitar…she held the spotlight alone". James Cotter of the Times Herald Record said that "Soprano Julie Ziavras masters the most difficult instrument, wowing her Montgomery listeners with her warm and compelling voice, appealing presence and wide range of repertoire… pour(ing) her full energy into each number with virtuosity and verve." 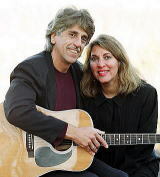 Ken and Julie, which was formed in 2001, have appeared in concert and at folk venues throughout the Hudson Valley and in the New York Metropolitan area, including Bodles Opera House, Howland Center, Warwick Valley Winery, Paramount Theater, Arden House, Puffin Cultural Forum, The Riverfest, Grand Montgomery Chamber Music Series, Donnell Library NYC, Merkin Hall, the American Cancer Society fund-raiser in Washington, DC and Year of the Rabbit, MD. Their music has been heard on webcasts with The Art Music Coffeehouse, NJ, RelaxRadio, Perth, Australia and on Ellopia TV in Greece. Ken and Julie's debut album entitled "The Dream" features 16 of Ken's original songs. "Best Folk Singing duo 2002: Listen, hear and explore something in their hearts"